DAILY SASS: Looking for Submissions + Contributors! 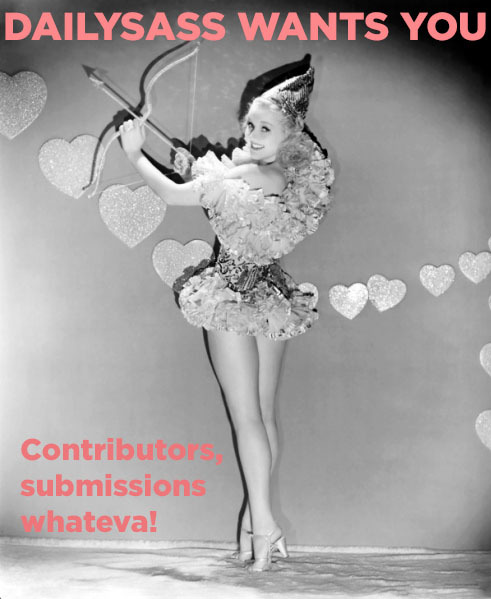 Looking for Submissions + Contributors! I've been beating myself up a lot lately because of my lack of content on this blog, and my lack of content to create. I felt like I hit a wall. But you know what? It's okay! I'm only human, and it's okay to take some time off and to ask for some help! I had an amazing brainstorming session with my AMAZING friend Candy about what I want to do with my blog and we came up with a few ideas. 1) I think I need to take a little bit of time off - nothing crazy, probably just the rest of the the month. But I want to take some time to actually write a bunch of stuff so that you can start expecting more regular content! 2) I WANT CONTRIBUTORS! I love the idea of having regular contributors, maybe just a handful of people that also love to write about their feelings and things they love as much as I do! I can't choose everyone, but if you're interested please contact me through the button on the side of this blog. Include your name, age, favorite pastry and a 500-word writing sample! If you don't think you can handle regular monthly contributions, but are interested in celebrating my FAVORITE holiday with me next month, please feel free to contact me with an idea and we can brainstorm! Thats all for now, pussycats! Thanks for being so patient with me throughout my whole 5 years of blogging! See you next month pussycats!